Those of us on the Cape Canaveral beach June 28 awaiting the launch of the second Mars Exploration Rover were by then pretty well acquainted with what seemed to be NASA's favorite word  "scrub." The word comes from the British Royal Navy, from back in the days when a slate was used to record all signals and orders. When something on the slate had been cancelled or completed, it was "scrubbed out." The Oxford English Dictionary designates its noun form a slang term, reserved specifically for the cancellation of a flying mission. Slang or not, NASA uses it to this day. And, in fact, through the popularity of the Mercury Astronaut Program in the 1950s and 60s, it seems to be NASA who introduced it to the American public. Along with the term "A-Okay." The view of the Boeing Delta II, carrying the Mars Exploration Rovers, from Cocoa Beach on May 28. NASA scrubbed the launch of that evening, but the Boeing Delta II successfully lifted off yesterday night, July 7. Photo by Matt Shindell. I am not sure how many of us were there awaiting the launch of the Mars Exploration Rover B (MER-B) Opportunity on the night of the 28th, but we seeemed to at least sparsely line Cocoa Beach  certainly not the large numbers of people that waited as NASA announced scrub after scrub of John Glenn's first orbit of the Earth. With cell phones we alerted each other of what scrub rumors were being passed along. That the original June 25 launch date had been scrubbed, and we'd been delayed to the 28th was the first thing most of us had learned when we arrived. Some of us, including myself and several members of the various MER instrument science teams, extended our stays and bet on the probability that the rocket would in fact launch on the new date. After all, NASA had told us that the problem  which had to do with the cork insulation around the first stage of the rocket  was fixable and on schedule. The only wildcard was the weather. At 11:58 p.m., the first launch opportunity was a scrub thanks to a boat in the no-safe zone, and wind. It seemed ridiculous that a boat could even get that close. We hadn't bet on a boat. "Isn't there a Coast Guard, after all, to take care of this sort of thing?" someone near me asked. But we soon had verification  a young woman called a relative watching NASA TV in a nearby hotel room  it was indeed a boat. Even grounded the rocket at midnight was an incredible sight. Because of the endangered sea tortoises that lay their eggs on the beach, there are no lights. 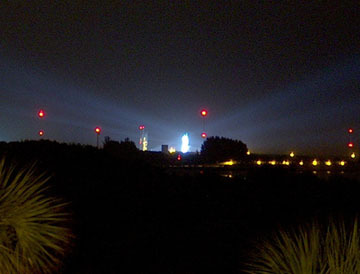 The rocket, lit up by at least half-a-dozen spotlights, stood out as the most brightly shining beacon I have ever seen. The periodic lightning flash over the ocean only made the scene more romantic. We stayed out, getting bitten by mosquitoes and whatever else was biting that night, and waited for the second opportunity, which never came. Strong high-altitude wind had done us in. We wouldn't see any launch that night. Most of us, with schedules already stretched by the first delay, wouldn't see any launch at all. We marched ourselves off the beach and back to bed. Resigned, we caught flights home in the morning. But last night, July 7, over a week later, at 11:18 p.m. EDT, as if to say, "with or without you," Opportunity launched aboard that same Boeing Delta II heavy launch vehicle. The spacecraft at its tip will land on Mars in January 2004, along with MER-A Spirit. And they're not just headed anywhere on the martian surface. They are headed to two very specific sites chosen for their geologic prowess, so to speak. Spirit, launched last month, is on its way to Gusev Crater. Visual images show that a large channel once ran through the crater, and scientists believe that the crater may have once held a lake. They will be searching Gusev for the sediments left behind. MER-B Opportunity is on its way to a less obvious site  one that visual images could never have picked out  Sinus Meridiani. The scientific interest for Sinus Meridiani comes mostly from thermal infrared spectral data. These data, provided by the Thermal Emission Spectrometer (TES) and Thermal Emission Imaging System (THEMIS) onboard NASA's Mars Global Surveyor and Mars 2001 Odyssey, indicate a large hematite deposit at this site. Hematite  a mineral that on Earth is known to form in water, often in hydrothermal systems such as hot springs  is one of the only water-related minerals that spectral analysis has yet to uncover on the martian surface. How the hematite in Sinus Meridiani formed is unknown. A large part of Opportunity's mission will be to figure out what processes were involved, and what role water played in the history of this region. Spirit and Opportunity both carry a miniature version of the TES instrument that first discovered the hematite. Arizona State University planetary geologist Phil Christensen credits the THEMIS and TES science teams for the Meridiani site choice. "I feel a fair amount of ownership for this site. A rover is going to a place that I said it should go to," Christensen said in a pre-launch interview. Principal investigator for the mini-TES as well as the original TES and THEMIS, Christensen also helped to design and propose the rovers' Athena Payload. While scientists studied pictures of the Gusev crater for years, the primary data on Meridiani came from TES, he said. "Without the spectral data it looks like a pretty bland place. Personally, I think this will be the more interesting of the two sites." Many of those on the beach beside me were members of Christensen's Mini-TES science team who will soon have their signatures on the surface of Mars. Attached to the Mini-TES is a plaque with the signatures of all those involved. Christensen, who has been involved with the NASA Mars missions since the Viking missions of the 1970s, says he has never missed the launch of any of his instruments. It seemed like the chance to watch this launch, of a mission where he was involved in not only design but also site selection, would be tough to pass up. But if Opportunity didn't launch soon, he said, he was going on vacation with his family with or without seeing it. I received an email from Christensen just before he left on vacation: "I am very disappointed to not see this one go," he said, "I have, however, tried to find a balance between Mars and the rest of my life, and I've decided that my family is more important."